Our banana chocolate chip muffins are a great way to use brown bananas. You can make these into mini banana chocolate chip muffins too! 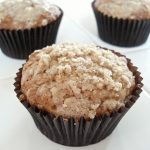 We love our banana muffins with chocolate chips and we think the combination of banana and chocolate is always a hit. In a large bowl combine flour, baking soda, baking powder, and salt. In a separate bowl, beat together bananas, sugar, cinnamon, egg, vanilla, and butter. Slowly stir and add in the flour mixture, just until mixed. Fold in chocolate chips. Place batter into muffin cups and, bake for 18-20 minutes. Cool on wire rack and enjoy once cooled.